.aar (Android Archive files, which are used when you for example use a Gradle dependency on the support library) are now properly handled by the editors. In earlier versions, the layout editor could render resources from .aar dependencies, but now code completion, XML resource validation etc. 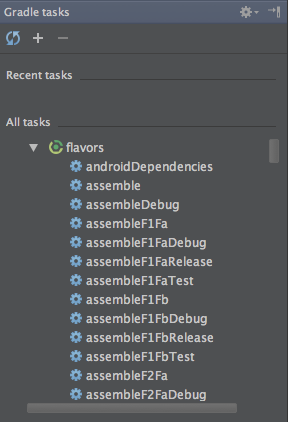 also properly handle these dependencies. The IDE will no longer auto-import the "android.R" class, since that can easily lead to confusion between the imported R class and the application R class. Similarly, if you use the Preferences > Code Style > Java > Imports > Insert Imports for Inner Classes mode, it will now deliberately exclude R classes. An important bug related to file refreshing after builds was fixed; this should fix cases of the R class not being resolved and shown in red in the editor. XML code completion now works on @+id/ and theme (?attr) prefixes. The gradle output parser has been revamped; it should now properly include source locations for errors in resource merging, and unrecognized output is added as information items, so you should no longer need to go to a terminal and run gradlew to get full diagnostic information; it should all be available within the IDE. If you are already running Android Studio, just restart it, or manually check for updates via Help > Check for Update... (on OSX, look in the Android Studio menu). This will download and install a small patch rather than download a full IDE image. We are not posting full installers for each weekly update. If you do not already have Android Studio, install the latest full install from http://developer.android.com/sdk/installing/studio.html#download . When you run that version, it will check for updates and upgrade itself via the patch mechanism.